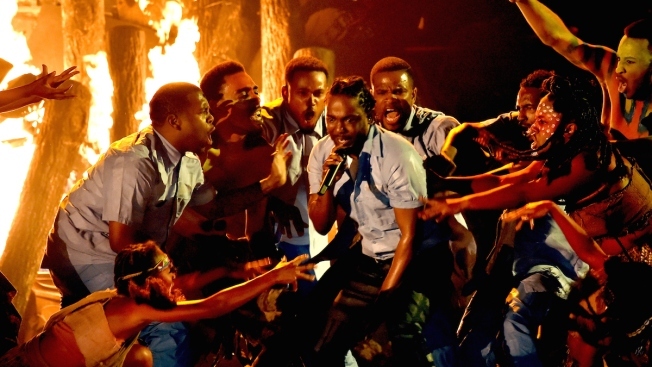 Kendrick Lamar's cinematic and energetic performance shined at a Grammys show full of slow songs and ballads. Kendrick Lamar's cinematic and energetic performance shined at a Grammys show full of slow songs and ballads. He started the performance shackled in chains singing "The Blacker the Berry," but broke free to perform his anthem "Alright" in front of a massive bonfire. He ended the performance in front of an image of a map of Africa labeled with the name of his California hometown of Compton. It was a true Grammy moment, one that was deftly executed, daring and culturally significant. Lamar was the big winner of the night with five trophies and although he did not take home album or song of the year, the Recording Academy showed that they are not so stuffy that they can't recognize a musical vanguard. After winning rap album of the year for "To Pimp a Butterfly," he was gracious and respectful of all the great rappers to come before him. He earned salutes from the White House's official Twitter account, pop star Taylor Swift and even Adele after her own performance. The massive success of "Hamilton" earned the Broadway musical a performance spot on the Grammys telecast, the first time the Grammys made room for a Broadway show since 2010. The young African-American and Latino cast performed via broadcast feed from New York and playwright Lin-Manuel Miranda's varied score mixing pop, R&B and rap fit perfectly on the Grammy show. The best part was when, minutes after their performance, the cast rushed back onstage to accept the Grammy for best musical theater album and Miranda delivered his acceptance speech in verse. Lady Gaga and producer Nile Rodgers put together a memorable tribute to the musical chameleon David Bowie, complete with her bright red hair, costumes reflecting his unique styles and splashy technical visuals. She managed to fit together snippets of 10 of his iconic songs, including "Space Oddity" and "Heroes," into a psychedelic sing-along as she danced all over the stage. It was clearly a performance that Lady Gaga put her whole heart into, even posting an Instagram video of her crying as she listened to the late rocker's song, "Blackstar," before taking the stage. Donning a new bob and a sparkly jumpsuit, Taylor Swift opened the 2016 Grammys with a performance of "Out of the Woods," but correctly noted — for one night — it was actually "1989," the title of her best-selling album. Backed by Jack Antonoff on guitar, Swift sounded triumphant as she walked through the audience while glitter rained down inside the Staples Center. Everyone was wondering if anyone at the Grammys would mention Kanye West' latest diss of the pop star, who claimed in a new song lyric that he made her famous. She didn't need to name drop him in her acceptance speech for album of the year for "1989," but delivered a strong rebuke against those she said would try to "take credit for your accomplishments or your fame." The Weeknd continues to impress on big stages and delivered another stirring performance of "In the Night," backed by a piano and a cellist. Because the Grammys are so often dominated by pop, it was a rare treat to see Bonnie Raitt join standout country singer Chris Stapleton and Gary Clark Jr. for "The Thrill Is Gone," a soulful tribute to the late blues legend B.B. King. They are all excellent musicians who let the guitars do the singing for once. One of the nights' highly anticipated performances fell a little flat when Adele had to deal with a slight audio issue. Her vocals cut out for a few seconds at the beginning of her performance of "All I Ask," which she powered through nonetheless. Still it was a disappointment for her fans considering her many stellar live performances. And Justin Bieber's performance of "Where Are U Now," with Jack U seemed a little rough and disorganized. He seemed to be aimlessly hopping around the stage looking for direction from the band.